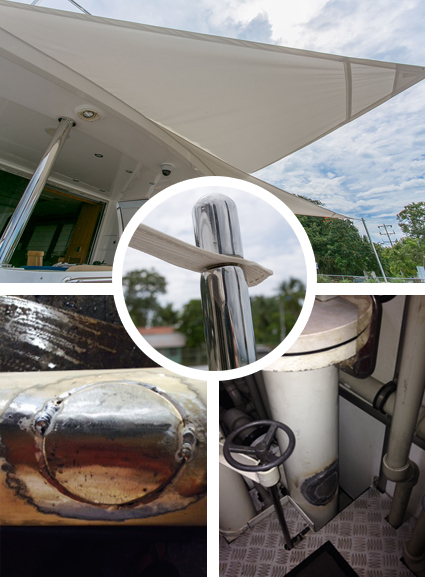 Premium Marine offers design, fabrication, repair and installation of specialty and custom projects. We can accommodate large and small scale projects, by tailoring our services and equipment to specific project requirements. Our key to success has been our ability to approach a wide array of projects for our broad customer base. We will custom design a plan that suits your repair or design needs while making sure we can meet your budget and your scheduling requirements throughout the entire process. Being forced to creatively use our minds due to Costa Ricas limitations, and being on the leading edge of process and technology has allowed us to accomplish all kinds of fabrication projects. Please contact us to schedule a consultation. Engine mounts, stinger supports, etc.